This is a conversation that took place some years ago over at DM's. Bill Harry was a sometimes active participant then. Bill Harry: Norman became a member of the Silver Beatles for a short time during the summer of 1960. 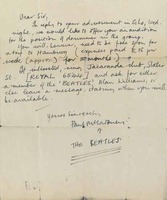 When Tommy Moore left the group following a gig at the Jacaranda coffee bar on Monday 13 June of that year, the Beatles were desperate for a replacement. They were pondering over the problem one night while sitting in the coffee bar when they heard the sound of drumbeats from across the street. Almost directly opposite the Jacaranda in Slater Street was a picture-framing establishment. Norman Chapman worked there as a picture-framer and renovator, and played drums as a hobby, practising on a hire-purchase kit in the offices of the firm in the evenings. They went into the street, trying to find where the sound was coming from. They knocked on the doors of the National Cash Register Office and Chapman popped his head out of an upstairs window of the building. They offered him the position of drummer with the band. Chapman, an imposing six-foot-two in height, accepted the job. However, he only managed to appear with them on three Saturday night gigs at the Grosvenor Ballroom, Birkenhead, on 18 and 25 June and 2 July, before he was called up for National Service and was conscripted for two years in Kenya and Kuwait. Member Ligger: I met Norman once in 1989 or 1990. I got his number from the phone book and just called to say that I was in Liverpool from NYC doing research for a book. I asked if I could possibly interview him about his Beatles' days. He was so surprised and self deprecating on the phone and said it was impossible. But I persisted saying that it was really important for my project to meet with him. He finally agreed to see me, but only if I would be his guest at a charity show for kids he would be attending that very evening. I arranged to meet up with Mr. Chapman at a working men's club somewhere in Anfield later that night. Perhaps I took a taxi to the address he gave me because I seem to remember the cab driver questioning the advisability of being in that area, at that time of night. The club was not easy to find, but eventually I got there, and the doorman had been expecting me. He bought me into a large darkened smoky room that was a cross between a theater and a pub. Then I was presented to a table of about four or five nicely dressed men in their late forties. Norman Chapman, the biggest of the bunch, stood up, shook my hand, and introduced me to his table of friends saying, "This guy has come all the way from New York City just to interview me for his book." That got a great laugh from his friends and sort of broke the ice. He immediately asked me what I wanted to drink, and I said, "the same as you, please." I seem to recall that he wound up ordering about half a dozen pints of 'mild,'a type of beer that I had never had before. The rest of the evening, except for the surprise of watching Ken Dodd on stage, is a bit of a blur, I'm afraid. He brought me there strictly for entertainment value. He really did not want to be the center of attention; that was my role, as far as he and his friends were concerned. And I was happy to play along with the lark. I had a great time that night. Everything Mr. Harry said in the above post was true. He was a gentle giant, wearing glasses and a long, very un-Beatles looking leather overcoat. A real sweetheart and gentleman. Mr. Chapman completely played down his role as temporary pre-Hamburg Beatles member and reveled in his role as host. It was a once in a lifetime event for me. Unfortunately, the book did not get finished. Guest: Hi - I've just stumbled across these posts while doing some research myself. Norman Chapman was my Dad and unfortunately, he died from cancer over 10 years ago. I read somewhere that someone said he was a teacher down South. What a load of old rubbish . He opened his own picture framing business in Southport, where he was very happy indeed. The problem with Dad was that he was a fantastic picture framer, a really artistic man, but he was a generous type of person who would give things away rather than charge a proper price for them! It's lovely to hear some of then nice things that people remember about him; he was indeed a very gentle character who was reluctant to talk about his very brief stint with the Silver Beatles. He only has one remaining sibling left, who lives a five minute walk away from the Jacaranda. When I was in Livepool two years ago, my Auntie Maria took me to the Jacaranda, where my Dad's old drumkit is hanging above the bar. I've only got one or two pics of Dad; one with the Saturated Seven, and old Joe Royal. He and Dad continued to be friends and even though old Joe passed away some time ago, young Joe still remembers to send my Auntie a christmas card. I have to tell you that the picture that's been posted on this site is not my Dad! I laughed my head off when I saw it...can't wait to show my kids tomorrow! Thanks again for remembering him in a lovely way. Guest again: I was approached by somebody a few years ago who said he was an author, and he was quite forceful in wanting to find out more. He said he was commissionred to write the authoritative story of the Beatles but how does one know that's for real? Anyway, I chose not to. For those who are intereted, my maiden name is Ann-Marie Chapman and I was born in August 1961. My Mum and Dad married towards the end of 1959, just before Dad joined the Silver Beatles and they divorced when I was about 2 or 3. I left home at 19, and have never seen my Mum since. She and my stepfather did not agree with my choice of partner and being quite a stong minded character, I stuck to my guns! When I was a child, my mum told my Dad's family that they should not allow Dad (Norman) to see me and they reluctantly agreed to her wishes. I met up with Dad when I was in my 30's, and was married with two children. It was the happiest moment of my life. My Auntie Maria (Dad's sister) made contact with me again and arranged all of this. It was a life changing experiece. I'm sure that none of this is interesting to any of you who are true Beatles' fans but we were only on the periphary of that story, so what the hell! I have been blisfully happy and have three lovely children. Hayley is 25 and Ovie is 22. Hayley and Ovie were given their first bicycles by their grandad (we bought them second hand from the newapaper) and I have photos of Dad running alongside them in Sefton Park, teaching them to ride their bikes on Christmas Day. Unfortunately, shortly after we moved from Liverpool to Brigthon in 1993, Dad's lung cancer spread rapidly and he died very soon afterwards. I think it was probably due to the fact that he continued to play in smoke filled venues; it couldn't have helped his condition. He never got to see his youngest grandson, Efe, who is now 11 and is a great football player. Efe loves Liverpool FC, unlike Dad who was an Everton supporter. I don't know what else to say. I could go on and on; it's been quite a nice experience just wriiting this message and sharing some memories. Some people who know that my Dad was a drummer say it's a shame that he was called up for national service just before the Beatles went to Hamburg, but to be honest, the life of a so-called pop star is fraught with problems and I don't think that lifestyle would have suited him. Niece Lilian Chapman: oh yeah i forgot to say Norman was a drummer in a dance band called the Saturated Seven, he was with them for many years! but i did used to live in a flat, in house belonging to Alan Williams. and even Alan said Norman was a brilliant drummer, and it was a shame that he was called up! the line up would have been so different ! also if im not mistaken Norman used the name Dave now and again! i have great memories of parties in the 80s at Alan and Beryl Willaims house being entertained by Bob Wooler and even having a wonderfull calypso, about me, sung to me by Lord Woodbine! it was weird to think i was with the same people who had brought the Beatles to light and had lost them too! and also people who could remember that my uncle was with the Silver Beatles!!!! as for years it was impossible for people to believe that this was the case! in the early 80s i worked making costumes for Arnold Schwarzeneggers first freature film Conan the Barbarian, meeting Arnie in his younger days was fun he was a good laugh and had a great sense of humour! ive worked with hundreds of famous people and have lots of anecdotes, where i love to tell people my stories , Uncle Norman was queiter and kept it to himself somewhat! Bobber thank you for sharing that post! I only knew the first part of the story. And the Guest part was one of the best posts I have ever read! Very touching and again thank you. This is the only known pic of Norman Chapman. It was taken from the book by David Bedford "The Fab 104'. I also would like to know if his drum kit is still at the Jacaranda Club since it's being remodeled? And if anyone has a pic of it? And Paul's letter for a reply to the ad in the ECHO 8-08-1960 for a drummer after Norman had quit. This is the only know pic of Norman Chapman. There are a few more pics in Bedford's book. Some of them are family pictures. I'm still trying to find out if his drum kit is still on display at the Jacaranda. I've seen some pics of the inside of the new remodeled club on the internet, but haven't seen it in any of them. And if it isn't on display where is it now? 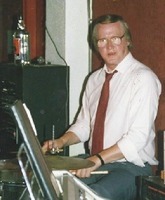 I also wonder if the family has any claim to the drum kit, or if Norm sold it to the Jacaranda Club? And just a little trivia sidenote: It'll be 55 yrs. (next Thursday) since Norman played with the Silver Beetles on June 18, 25 and July 2nd, 1960. Sweet Jesus, I was thinking Mark Chapman, until you mentioned 55 years ago!!! !